Your air conditioner relies on the flow of refrigerant to transfer heat from one place to another. However, the refrigerant can leak, leading to a wide range of issues. Without refrigerant, your AC will be unable to cool your home, and eventually, a leak could lead to a full system breakdown. If you see fluid coming from your AC, be sure to hire a professional to seal the leak and recharge the refrigerant. Short cycling is a term used to describe when your system repeatedly turns on and off without ever completing a full cooling cycle. Not only does this put a lot of strain on your system, but it is also extremely inefficient. If you see that your system keeps turning on and off, be sure to contact a professional right away. Your air conditioner has two fans: the evaporator fan and the condenser fan. The evaporator fan pushes cool air into your ductwork which the condenser fan helps remove heat from your system. Issues can develop with these fans and lead to a variety of other problems, including poor performance. Various hot and cold spots throughout your home indicate that there is an issue. There a variety of issues that can cause uneven cooling in your home, so it is important to have your system and your ductwork inspected by a professional to pinpoint the exact source of the problem. The primary role of your air conditioner is to circulate cool and conditioned air throughout your home. So, if you notice that your system is not producing any cool air, it is definitely a cause for concern. If this happens, hire a professional right away, as a faulty AC could leave you quite uncomfortable during the season you rely on it most. Hiring a professional is the best way to ensure a job well done the first time. Sure, there are going to be plenty of amateurs willing to service your system, but sometimes an attempt to save money could end up costing you much more in the long run. 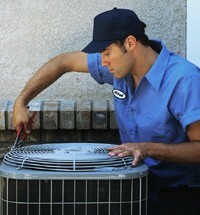 Only a professional has the knowledge, training, and experience to properly handle complex AC repairs. To schedule your AC repair services, contact Bayonet Plumbing, Cooling, & Heating.